Given the number of people the husband and I know who've visited the Angkor temples, we had somehow thought that the place would be swarming with Indians. But during our stay in Cambodia, we saw exactly two Indians - two jeans-clad Tamilians who must certainly have been melting in the heat. There were a handful of NRIs and PIOs as well (identifiable by their accents). The lack of Indians is a bit strange, because Hindu Indians are the people best placed to understand and appreciate these temples and their iconography. 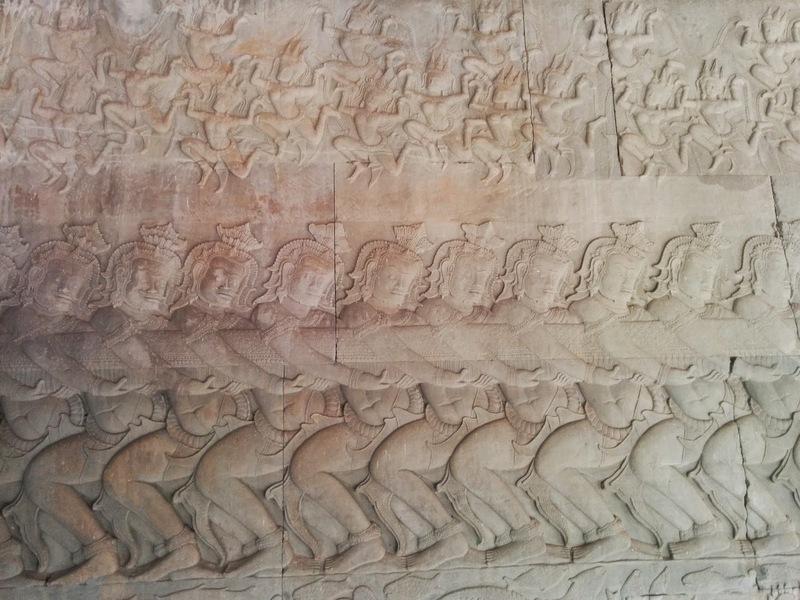 The Khmer kings carved every inch of their temples with Hindu Gods and scenes from Hindu mythology, and Hindus who know their mythology would be best able to put these carvings in context. In fact, I thought these temples would make great Hindu pilgrimage spots, though most are not active (and the ones that are have long been Buddhist). As I watched huge buses disgorge dozens of Chinese / Caucasian tourists, I wistfully imagined similar buses full of sari-clad paatis and maamis eager to see the temples and their carvings. But it's not that Indians have never been there. We found out quickly enough that people from our country have been there and have left a solid reputation behind. On our very first night there, we went out for a stroll and landed up at Central Market, which is on the main road of Siem Reap. We decided to do some window-shopping, and liked something (I can't remember what it was). We asked the shopkeeper for the price, and she told us. We thought it was too high to even bother negotiating, and we started to leave. And that's when she laid the bombshell, "You Indians. You look, you no buy." Well. I couldn't argue because in that particular instance, it WAS true. Though we did end up buying stuff later, I can't fault the Indians who decided not to buy anything. Cambodia's street markets are clearly targeted at people who earn in dollars and so don't mind spending in dollars. Indians who earn in rupees and have access to India's cheaper street markets would definitely think twice before buying anything. I always thought the same thing about Thailand too. Ram, Ayodhya - we have a lot in common. It is so amazing to see how cultures have seemingly evolved from similar roots. Yes. Or rather - it's amazing the amount of influence Indian culture used to have.